This past week my parents were visiting, and I took some well-earned vacation time after the AU Summit to take them on a tour of the historic highlights in the north of of Ethiopia. My dad and stepmom are pretty intrepid travellers; they even visited me in Guinea, which no one - and I mean NO ONE - does. In comparison to putting together a tourist itinerary in Guinea, making arrangements in Ethiopia is a piece of cake. Just pick a tour company and they'll plug you in to one of the usual tours. Simple. We started our tour in Bahir Dar, a quiet town on the shores of Lake Tana, the third-largest lake in Africa. Aside from just being able to look at a body of water so large you can't see the opposite shore, the main attractions are the dozens of monasteries dotting the shores of the lake and their associated art and treasures. It would take weeks to see them all, but most people take in a handful on a quick day tour. We saw one. But we REALLY saw it. Our tour guide was from a priest family and told us absolutely everything there was to know about the place, including the symbolism implicit in the numbers of columns and stairs in the building, and the stories behind every single fresco in the church. 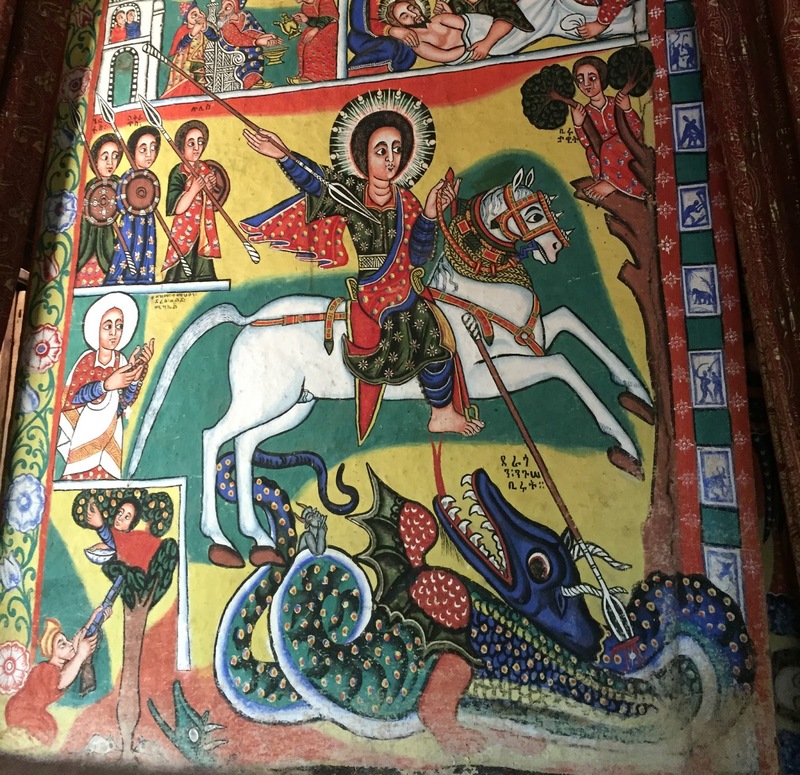 There were the classic tales from Sunday School, but also some new ones like the martyrdom of Saint George, Ethiopia's patron saint, and the story of Saint Mary and the cannibal. The next stop was Gondar, seat of Ethiopia's kings from the 16th to 19th centuries. We toured their castles and heard more great stories. My favorite was the tale of Empress Mentewab, who concealed her husband's death from the court, saying he had gone on one of his periodic incognito wanderers through the kingdom, just long enough for the court to agree that she should take over as regent in the event that he were not to return. When the local priests spread a rumor that she was having a liaison with visiting explorer James Bruce, she decided to prove them all idiots by devising a puzzle none of them could solve: how to get a calabash out of a deep hole without a rope or ladder. One of her loyal advisors solved it by filling the hole with water and floating the gourd to the top. 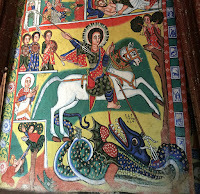 There's also a church in Gondar famous for its ceiling painted with concerned and disappointed angels who really wish you would just work a little bit harder on your immortal soul. From my perspective, the real highlight of the trip was Lalibela, home to a dozen churches handcarved out of the mountains, the outsides top to bottom and then the insides in from the doors and windows. According to legend the project was inspired by a dream King Lalibela had in which God asked him to build a new Jerusalem, and the whole complex was completed in only 23 years thanks to a small army of stonemasons working all day and a crew of angels taking over at night. The results are undeniably impressive, featuring vaulted ceilings, intricately carved archways, and cruciform columns. But the most impressive thing about the churches is what's not there: tons and tons of volcanic stone chiselled out by hand. No wonder they named the town after the king who built them. I also liked that they are still working churches, and you could tell that for the Ethiopian tourists it was a big deal for them to be there. This place should really be much more famous than it is, but I guess being located in a dusty mountain town in a little-visited country counts against it. Our last stop, Axum, was a bit of a letdown in comparison. There are still cool things though, most notably the obelisks erected by the kings of Axum to display their awesome power. Axum was a big deal from the 3rd century BCE, a Red Sea trade hub minting its own currency and trading with the Roman Empire until the rise of Islam eventually snuffed it out. Axum is also home to the Ark of the Covenant, the real one, which according to Ethiopia's founding myth was brought there by Menelik I, son of King Solomon and the Queen of Sheba. You can't actually see it, of course. It's in a chapel, surrounded by a fence, which unclean and unholy females like myself aren't allowed within a hundred yards of. Only one monk, the designated keeper, is ever allowed to look at it. The Smithsonian has a great article on it if you're interested. It's a powerful story, central both to the identity of the Ethiopian state and the Ethiopian Orthodox church, but not much to look at. It was a relatively quick trip but a very enjoyable one, especially since I hadn't had much of a chance to get out of Addis before this. Ethiopia really has incredible historical and cultural wealth, and I would never have had any idea any of this stuff existed if I hadn't taken a job here. This amazing opportunity to get to know the world we all live in is still one of my favorite things about the Foreign Service.